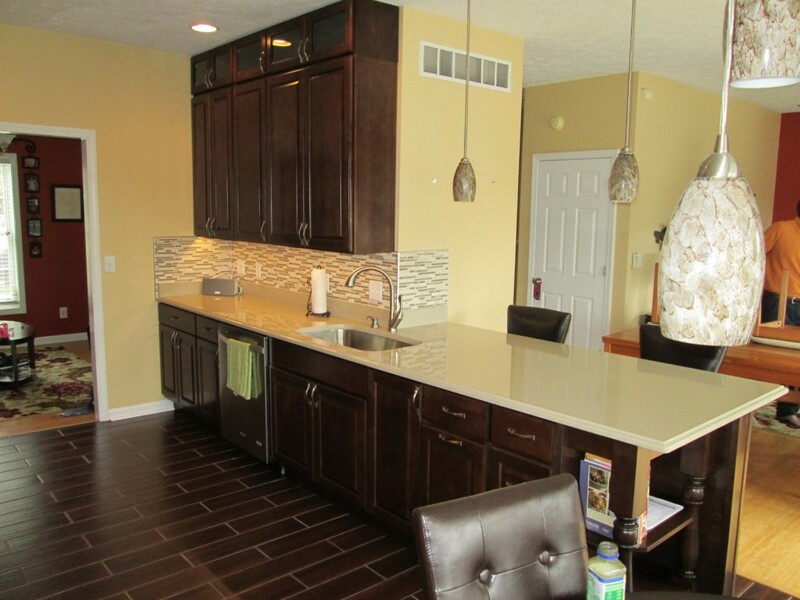 Our crews recently completed a beautiful kitchen remodel that completely changed the entire feel of the main level! 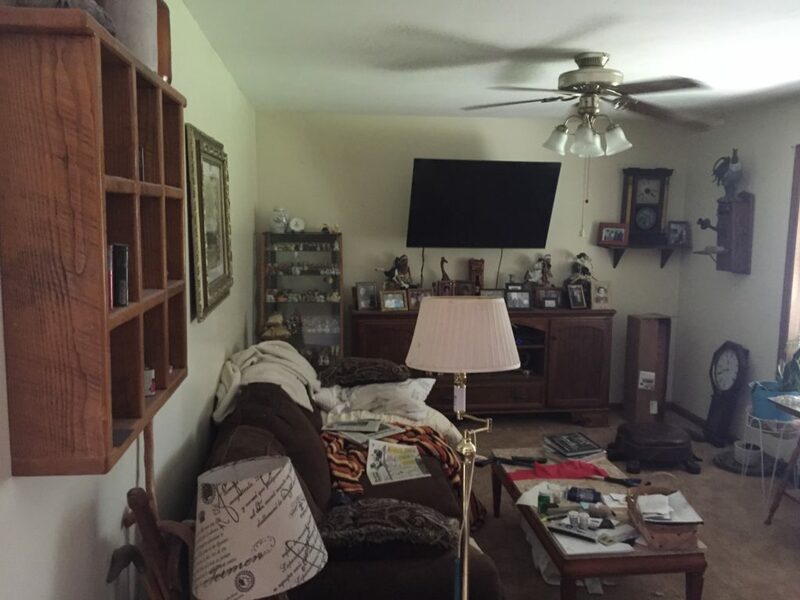 Just to help you visualize the change, let’s start off with a before and after picture! 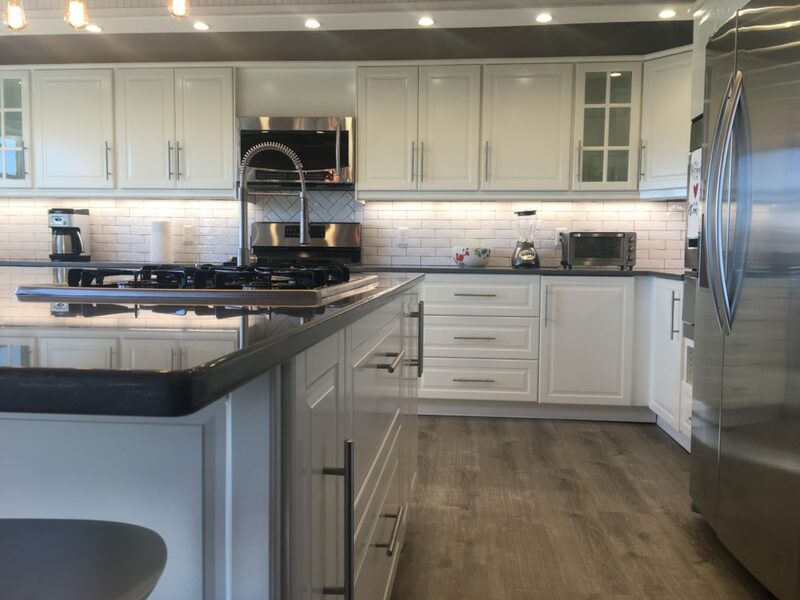 Now let’s dive into the details of the 6 things we thought made this kitchen amazing! 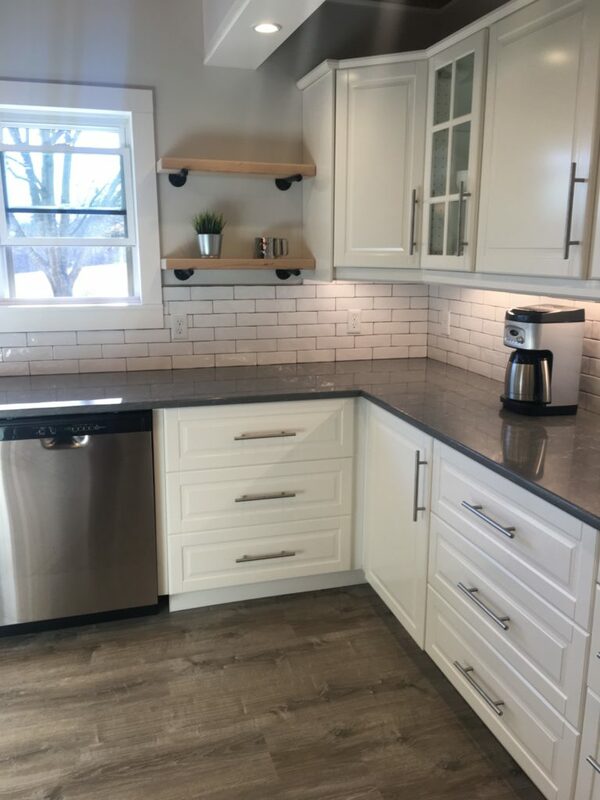 These cabinets came from IKEA and were assembled on site by our crew. The cabinets definitely aid in making this kitchen feel bright and cheerful! The white farm sink is a great addition to this kitchen, both aesthetically and for functionality. #3 – The Custom Lighting! 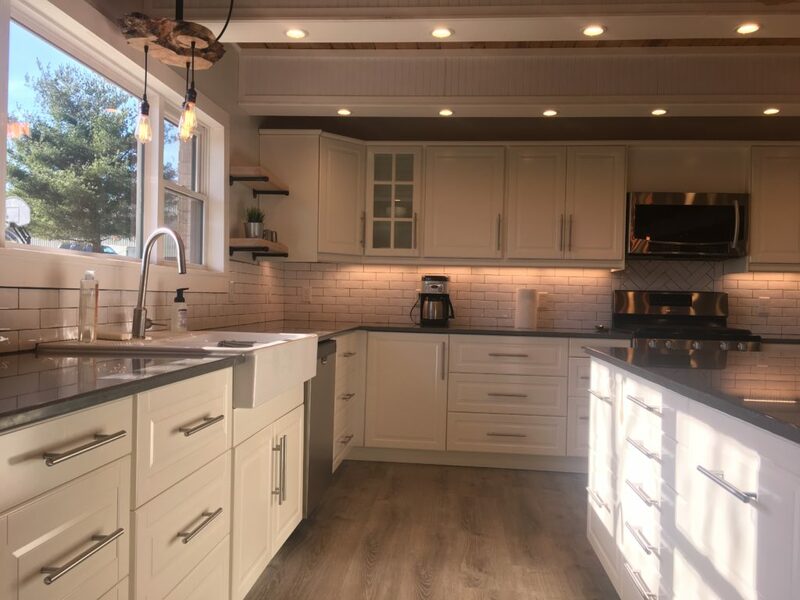 We went to town on the lighting in this kitchen with two custom wood light fixtures (hanging over island and sink), under cabinet lighting, and recessed lighting in the beams over kitchen. 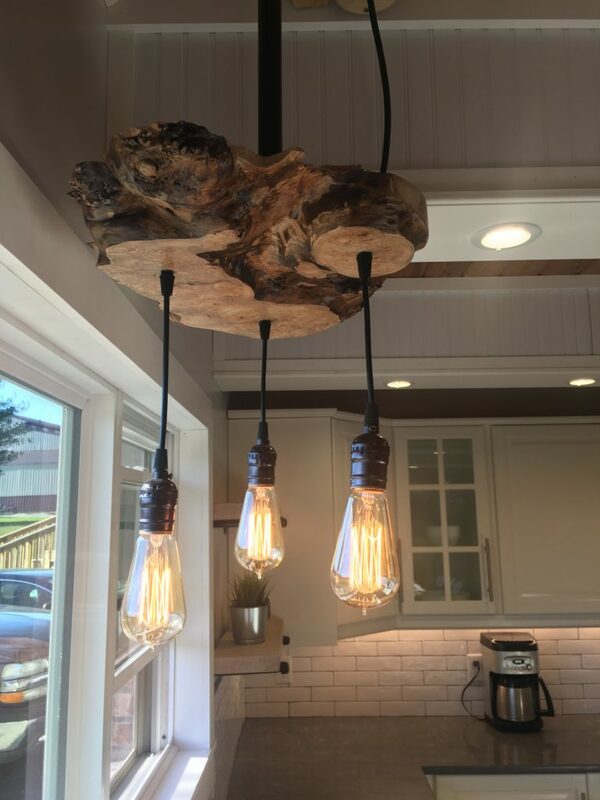 The live edge wood light fixtures were made by our crews. Similar fixtures will soon be available for sale online as our crews plan on making more! The live edge pieces came from RRAW Rough Cut Lumber in Spencer. 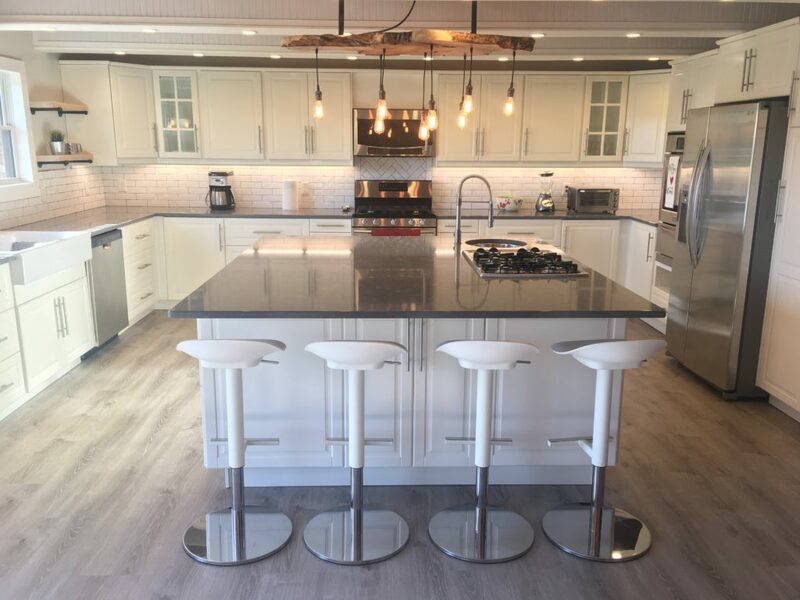 This island is the center of the kitchen and it doesn’t disappoint! 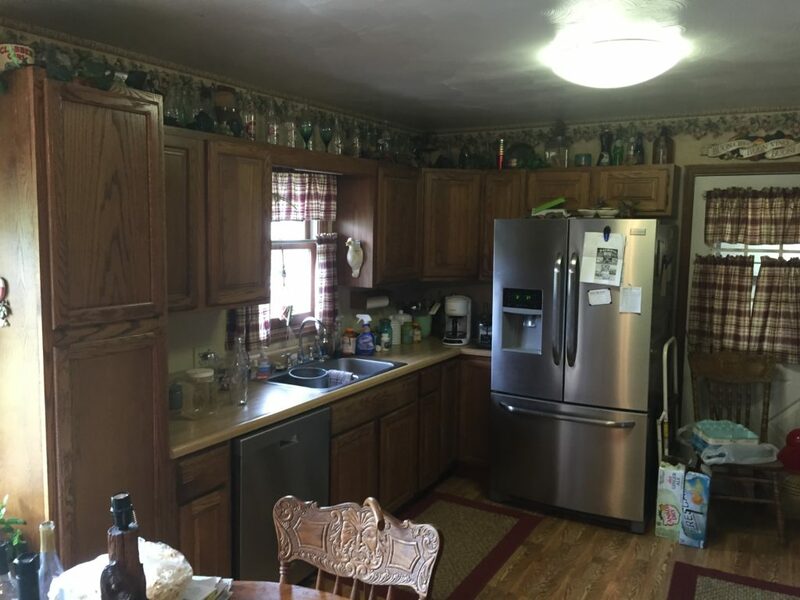 There is storage on all four corners, a prep sink, a cook top, and bar seating on the end. What more could you want from an island? 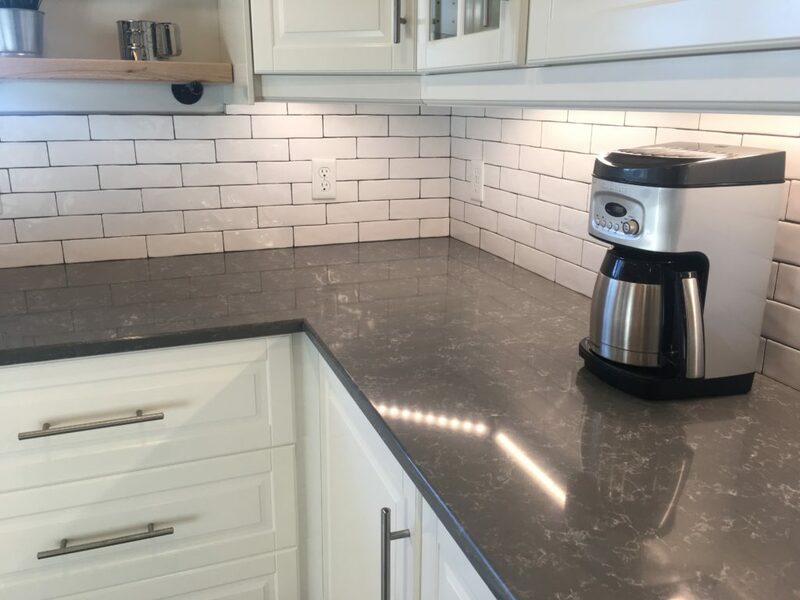 We love the contrast of colors between the white tile back splash and gray counter top! 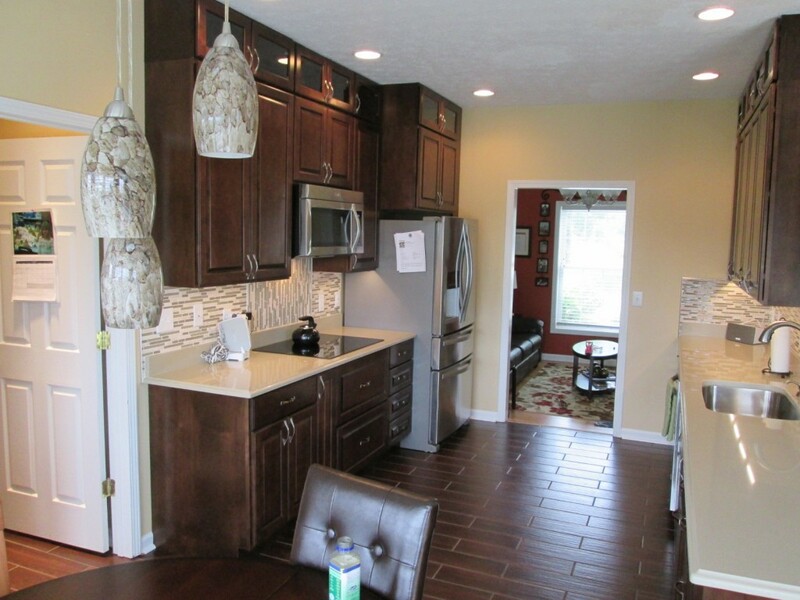 And last but not least, we really like the touch of flavor these open shelves add to the kitchen! So what are you waiting for? Let’s turn your kitchen into a place you can’t stay away from! 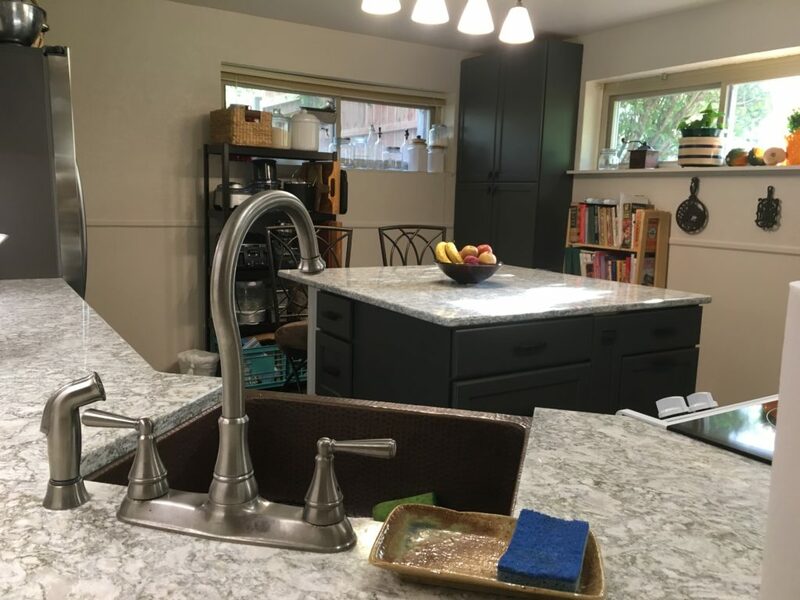 We recently finished up a kitchen remodel in Bloomington that completely changed the look of the space. 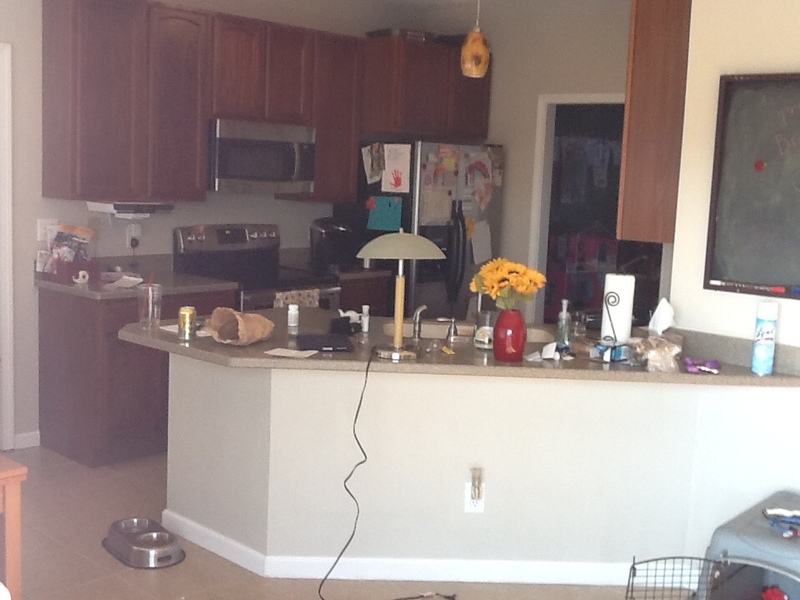 This kitchen got new flooring, cabinetry, countertops, lighting, and of course paint! 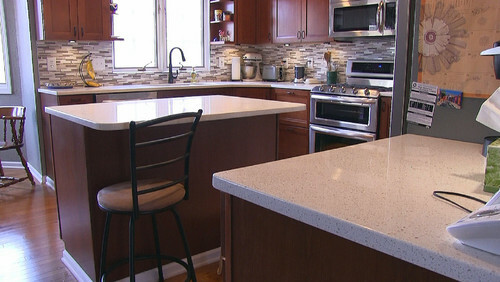 Here are five of our favorite things from this kitchen remodel! 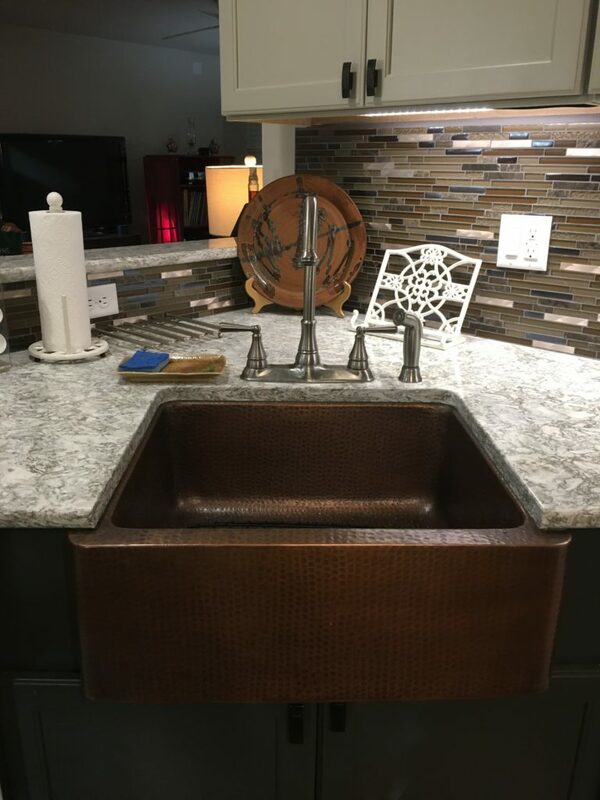 #1 The Copper Apron Sink. 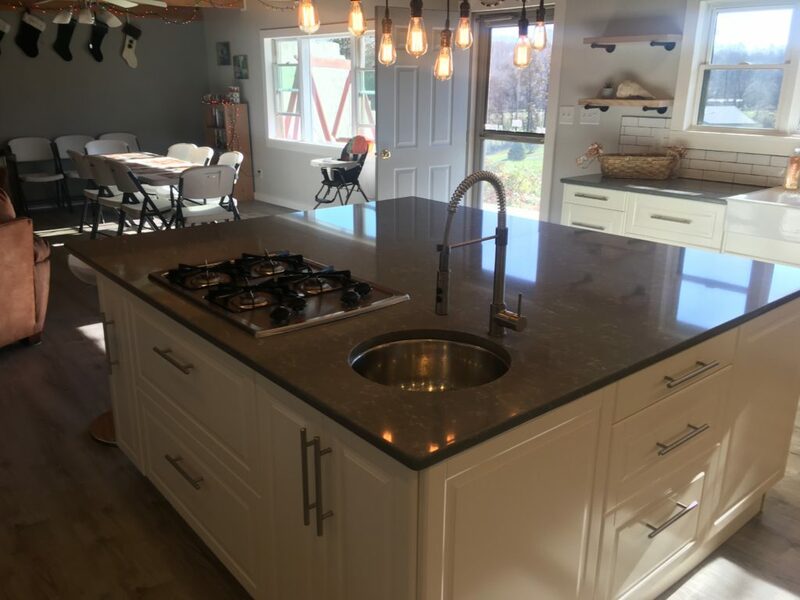 We thought this sink added a nice, subtle flare to this kitchen. #2 The Tile Backsplash. 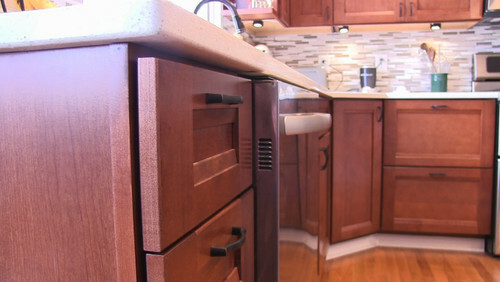 We really liked the way the back splash contrasted and complimented the countertop and cabinetry. #3 The Flooring. Vinyl plank flooring has come a long way in recent years! #4 The Lighting. The combination of outside lighting and artificial lighting helps make the space feel bright and warm. #5 The Cabinet Colors. 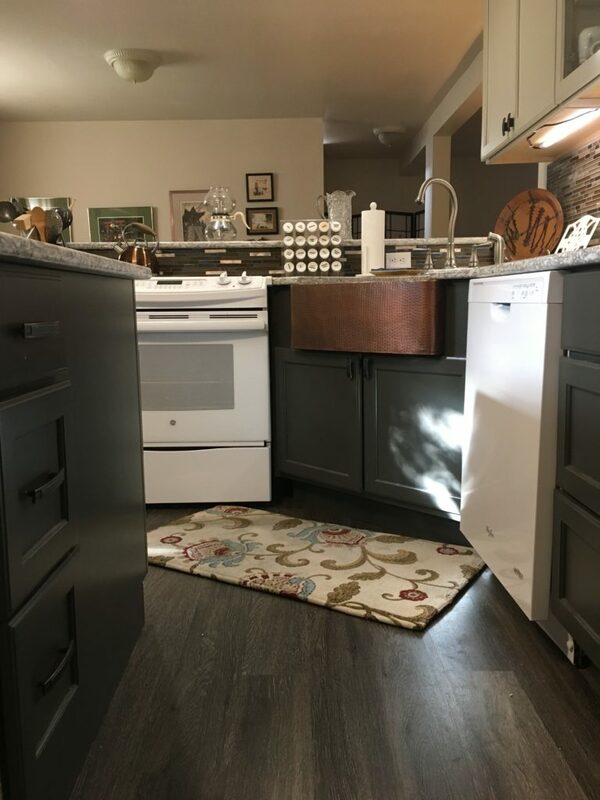 We liked the way the two cabinet colors came together to make the space unique. Maybe this drawing will give you a better visual of what they wanted . 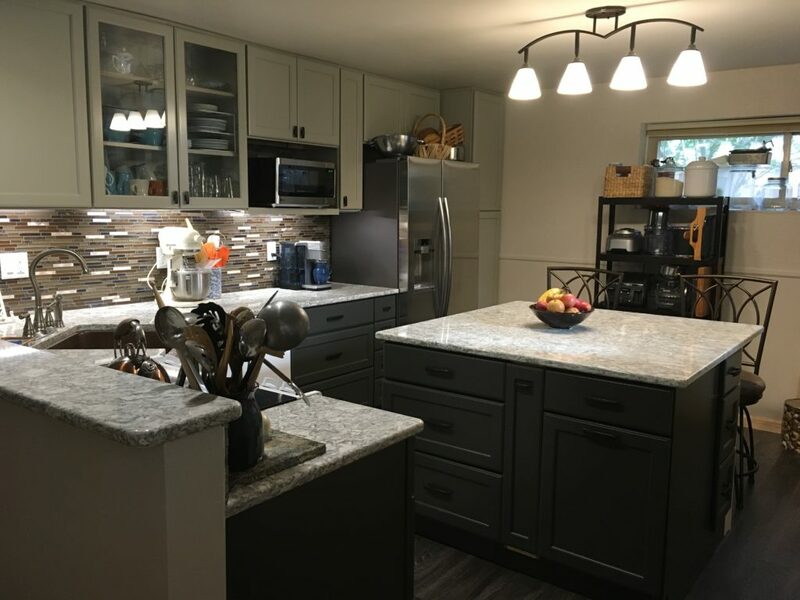 . .
Our favorite transformation in this project was how open the area was after the remodel! The kitchen and dining room looked so much larger even though all we had done was remove a wall! Adding on to your existing house can be very rewarding! 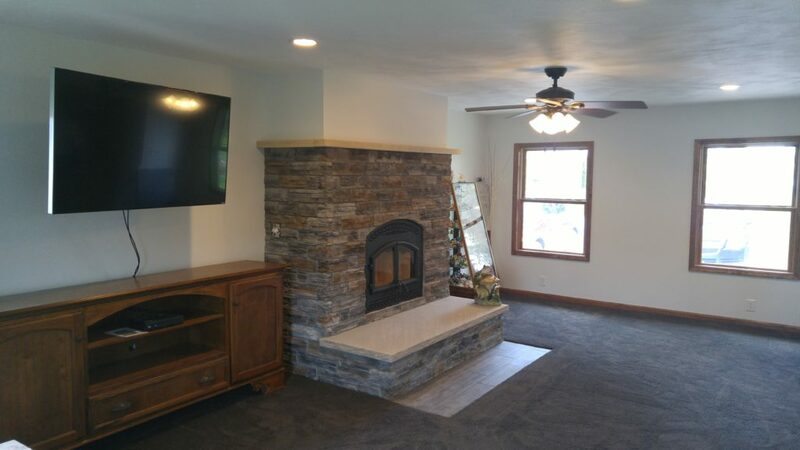 This new room addition turned out beautiful and made the house feel brand new! 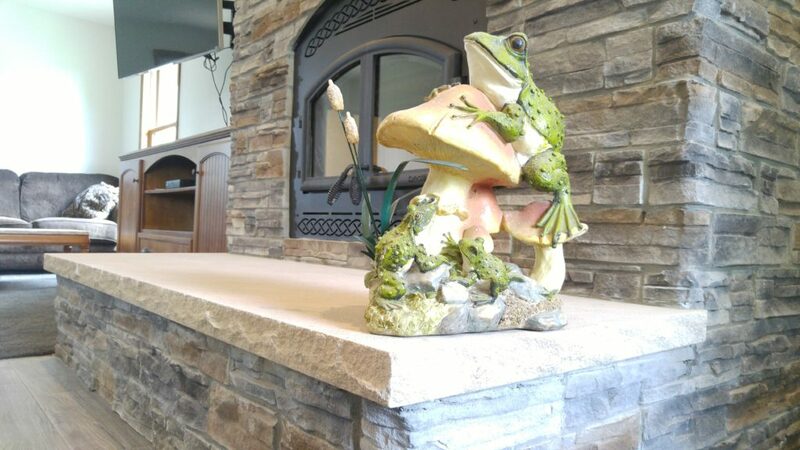 The customer wanted a fireplace from the very beginning but wasn’t sure if they could work it into the budget. In the end they decided to go ahead and it turned out to be the focal point of the new addition! Whenever you remodel or add on to an existing house you always run into trying to match the original materials. This happened with the brick wainscot on this job. 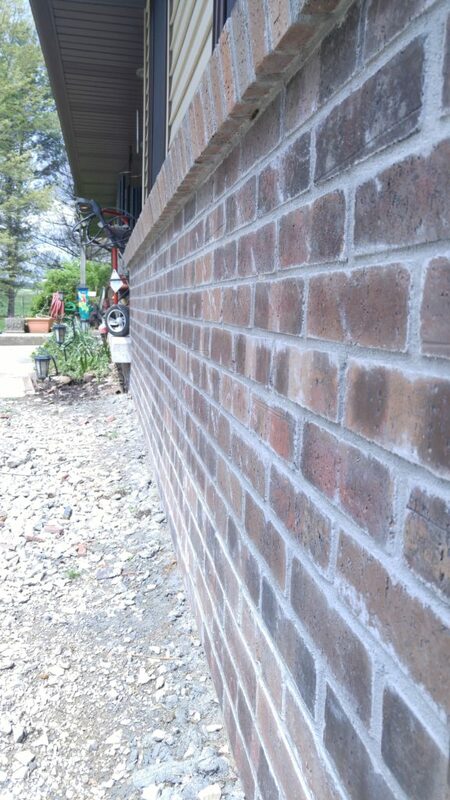 We found out that the original brick on the house was a color that no one sold anymore . . . but no worries! After some team work and a little ingenuity we ended up creating a custom stained brick that matched the rest of the house! 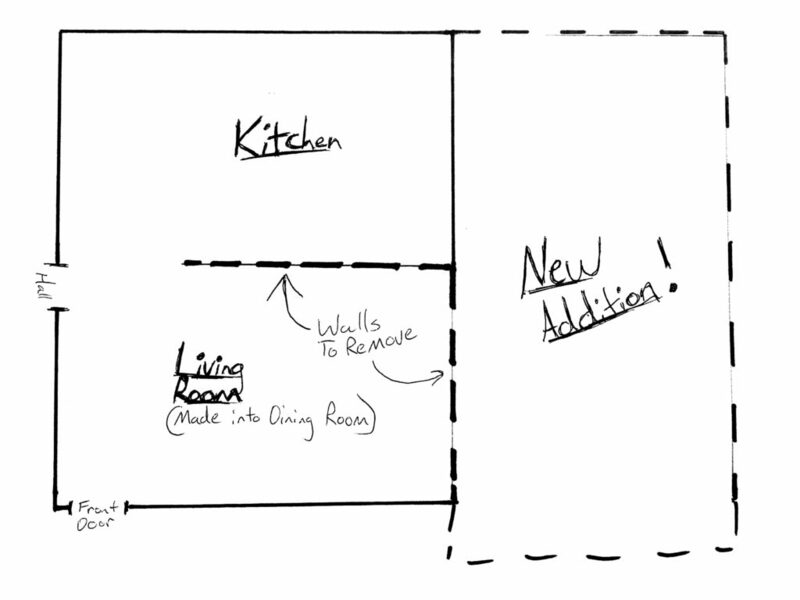 Kitchen remodels always deserve their own paragraph. 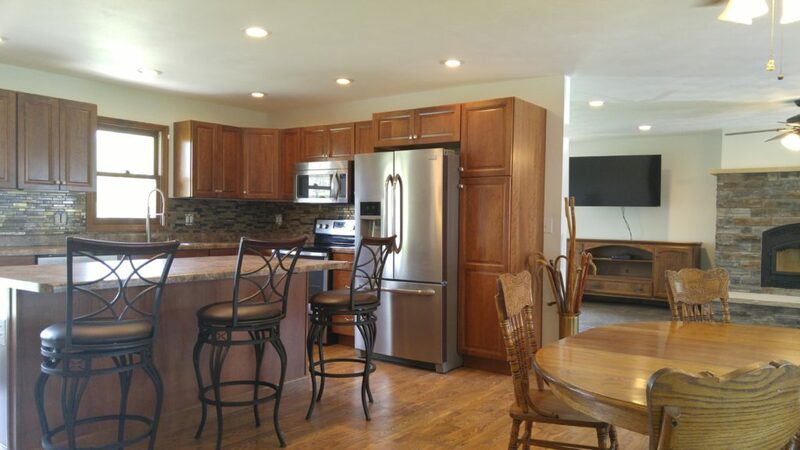 This kitchen got new cabinets and countertops along with undercabinet lighting, backsplash, and recessed lights. It all tied together nicely and made the customer very happy! Thanks for reading! 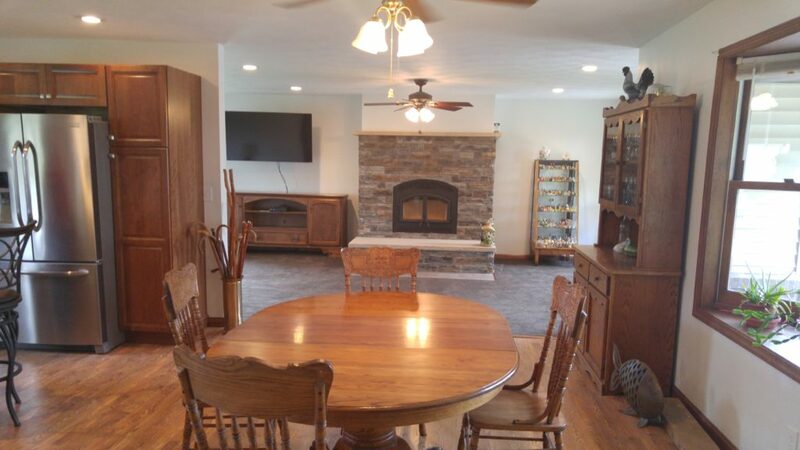 Feel free to comment on this job, ask questions, or contact us if you would like an estimate on your remodel! 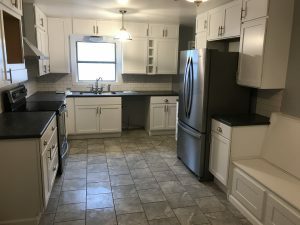 This was a complete kitchen remodel with new cabinets, flooring and appliances. 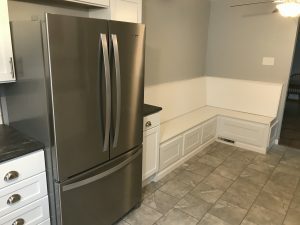 The cabinets are solid maple with glass door uppers. 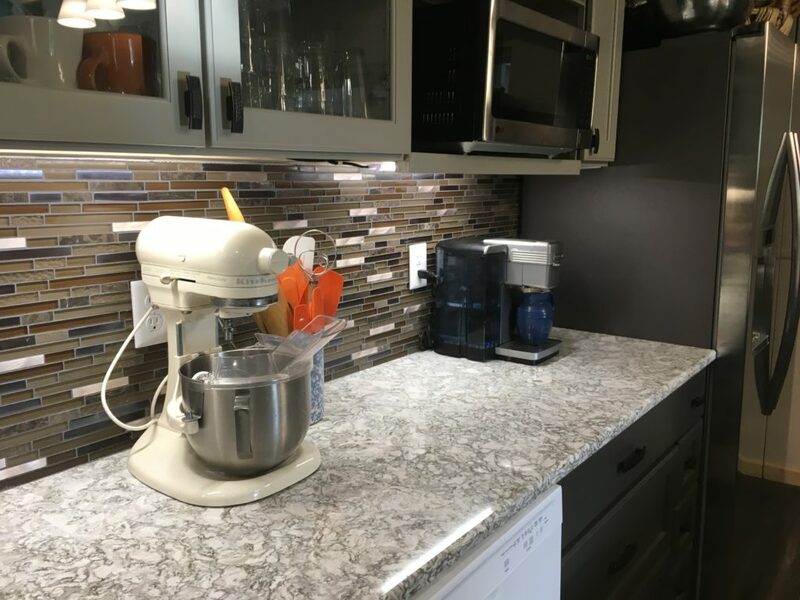 The counter tops are a wheat colored quartz, with a mosaic tile backsplash. 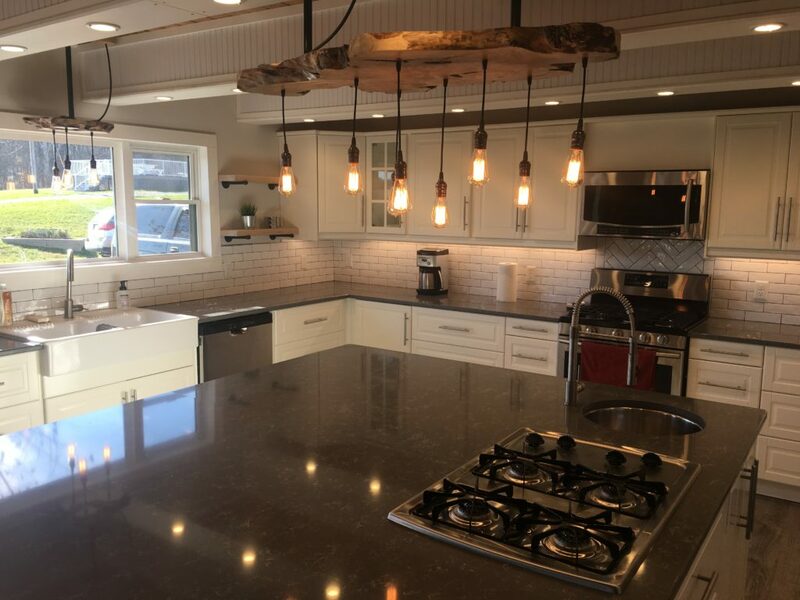 The wood grained flooring is porcelain tile, and this modern kitchen is well lit with new can and pendant lighting.